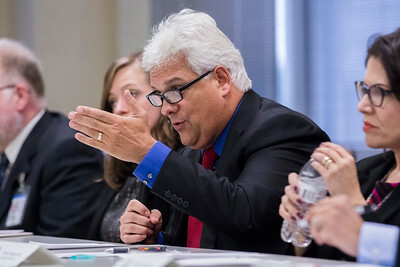 Sarah Nader - snader@shawmedia.com McHenry County Department of Health Administrator Mike Hill spoke during Thursday's Governor's Opioid Overdose Prevention and Intervention Task Force meeting in Woodstock Nov. 16, 2017. 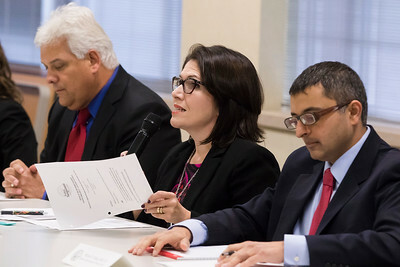 Sarah Nader - snader@shawmedia.com Nirav D. Shah, Director of the Ill. Dept. 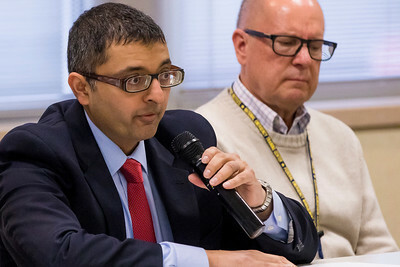 of Public Health, spoke during Thursday's Governor's Opioid Overdose Prevention and Intervention Task Force meeting in Woodstock Nov. 16, 2017. 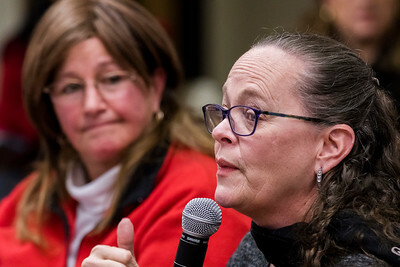 Sarah Nader - snader@shawmedia.com State Sen. Pamela Althoff spoke during Thursday's Governor's Opioid Overdose Prevention and Intervention Task Force meeting in Woodstock Nov. 16, 2017. 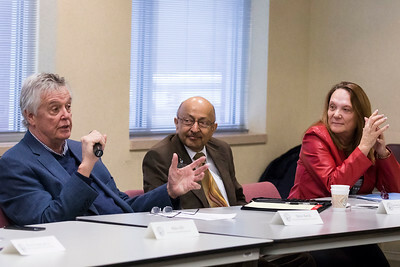 Sarah Nader - snader@shawmedia.com State Rep. Steve Reick (left), Arvind Goyal, Medical Director at Illinois Department of Healthcare and Family Sercies and State Sen. Pamela Althoff spoke during Thursday's Governor's Opioid Overdose Prevention and Intervention Task Force meeting in Woodstock Nov. 16, 2017. 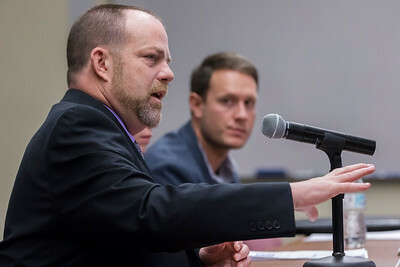 Sarah Nader - snader@shawmedia.com New Directions Addiction Recovery Services President Chris Reed, spoke about his story with opioids during Thursday's Governor's Opioid Overdose Prevention and Intervention Task Force meeting in Woodstock Nov. 16, 2017. 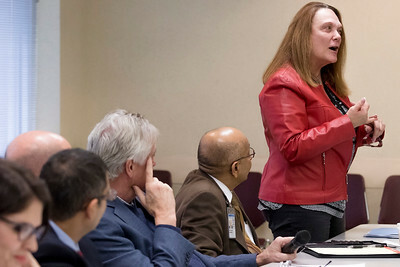 Sarah Nader - snader@shawmedia.com NICU Nurse at Center Health Systems Molly DeGroh spoke during Thursday's Governor's Opioid Overdose Prevention and Intervention Task Force meeting in Woodstock Nov. 16, 2017. 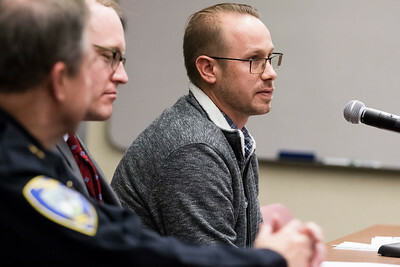 Sarah Nader - snader@shawmedia.com Rosecrance Director Chris Gleason spoke during Thursday's Governor's Opioid Overdose Prevention and Intervention Task Force meeting in Woodstock Nov. 16, 2017. 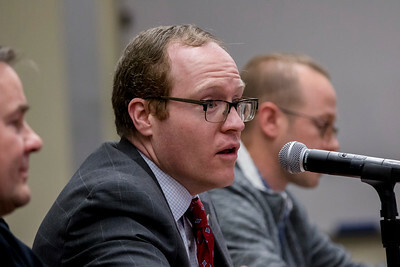 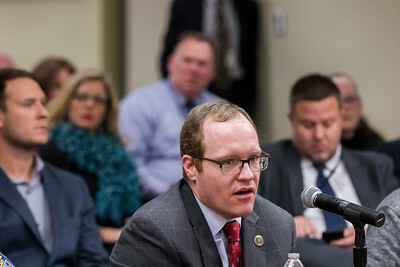 Sarah Nader - snader@shawmedia.com McHenry County State's Attorney Patrick Kenneally spoke during Thursday's Governor's Opioid Overdose Prevention and Intervention Task Force meeting in Woodstock Nov. 16, 2017. 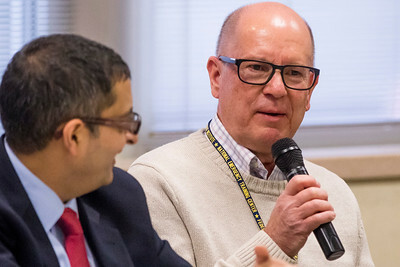 Sarah Nader - snader@shawmedia.com Chief Patrick Finlon spoke during Thursday's Governor's Opioid Overdose Prevention and Intervention Task Force meeting in Woodstock Nov. 16, 2017. 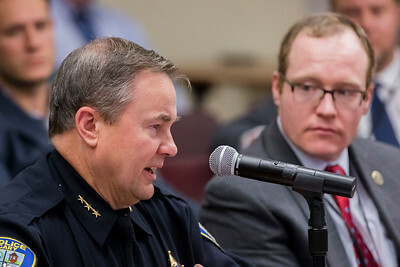 Sarah Nader - snader@shawmedia.com Sergeant Michael Muraski spoke during Thursday's Governor's Opioid Overdose Prevention and Intervention Task Force meeting in Woodstock Nov. 16, 2017. 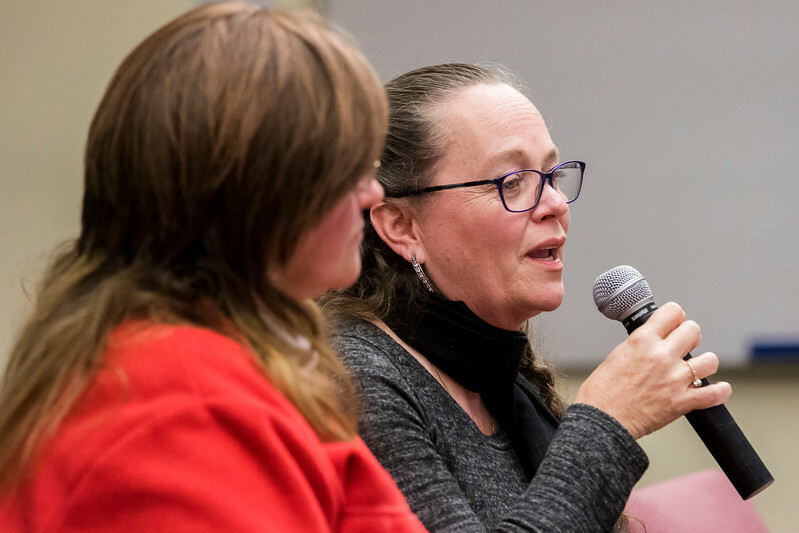 Sarah Nader - snader@shawmedia.com Laura Crain with the McHenry County Substance Abuse Coalition spoke during Thursday's Governor's Opioid Overdose Prevention and Intervention Task Force meeting in Woodstock Nov. 16, 2017. 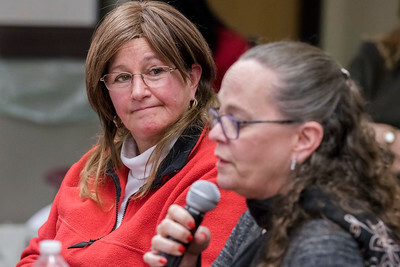 Sarah Nader - snader@shawmedia.com McHenry County Coroner Anne Majewski (left) listens as Laura Crain with the McHenry County Substance Abuse Coalition spoke during Thursday's Governor's Opioid Overdose Prevention and Intervention Task Force meeting in Woodstock Nov. 16, 2017. 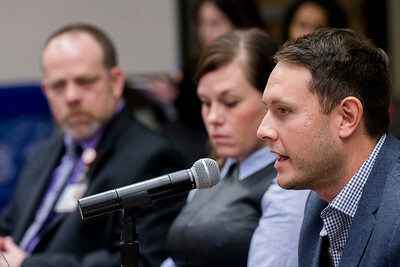 Sarah Nader - snader@shawmedia.com Lt. Gov. 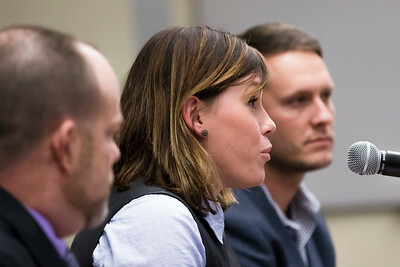 Evelyn Sanguinetti (center) spoke during Thursday's Governor's Opioid Overdose Prevention and Intervention Task Force meeting in Woodstock Nov. 16, 2017. Laura Crain with the McHenry County Substance Abuse Coalition spoke during Thursday's Governor's Opioid Overdose Prevention and Intervention Task Force meeting in Woodstock Nov. 16, 2017.